There’s also a handful of hotkeys — two for internet stuff and seven multimedia ones — although they’re found on the function keys, so you’ll have to toggle in order to use them. Aside from that, everything looks pretty straightforward. 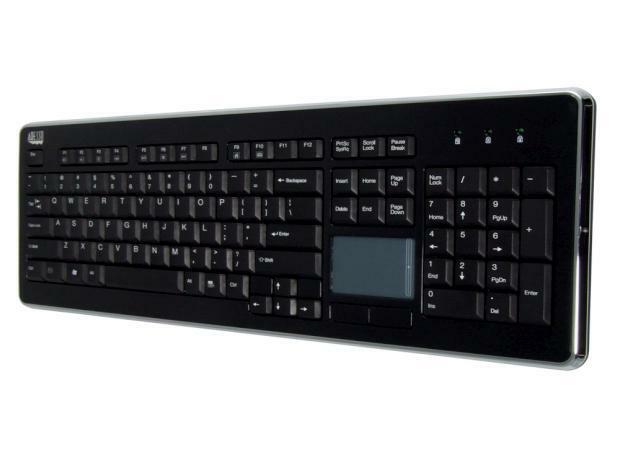 The included touchpad features a vertical scrolling area and two mechanical buttons, and the keyboard connects via USB. If you’re looking for a keyboard with a built-in touchpad, then $60 is a pretty decent price. Other than that one feature, though, the SlimTouch appears to be a relatively run-of-the-mill input device. It’ll be available shortly direct from Adesso and various popular internet retailers.